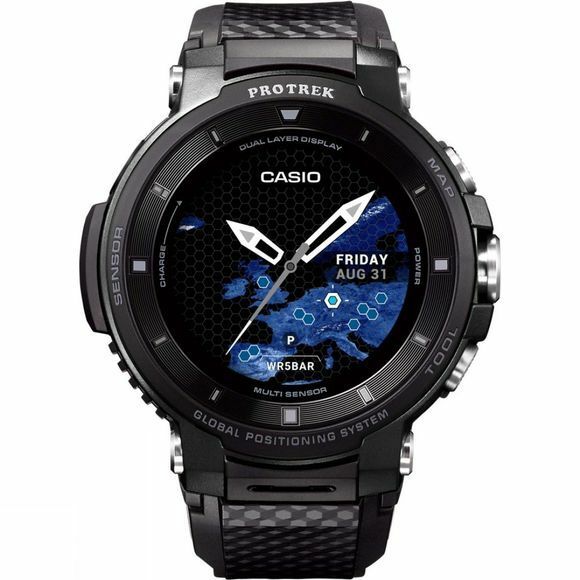 Casio have combined smart watch functionalities together with maps and GPS capabilities, housed in a MIL-STD-810G wristwatch to create the ProTrek Smart WSD-F30, perfect for adventurers and outdoor enthusaists alike. The WSD-F30 has a dual-layer monochrome LCD capacitive touchscreen for easy use and an increased battery life. In normal use with GPS, Wifi, Bluetooth and the colour touchscreen all running, the watch is able to perform for up to 1.5 days. 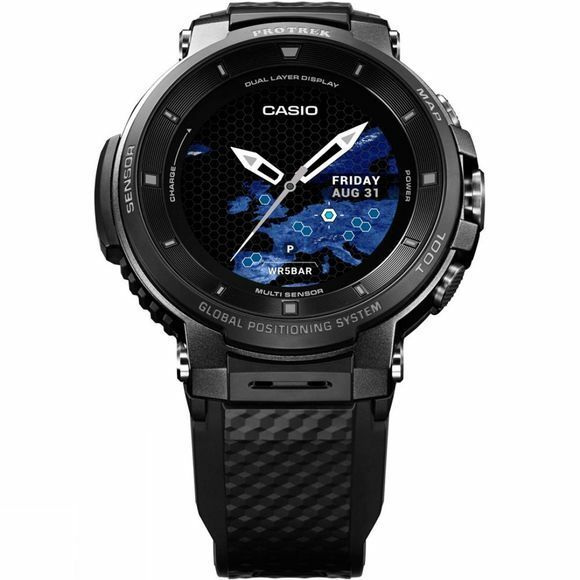 However with the Extend Mode you can increase this to 3 days without the use of Bluetooth and Wifi, and Multi-Timepiece mode offers up to a full month of battery life* while still showing key sensor information such as time, compass bearing, altitude and atmospheric pressure. Full colour maps can be downloaded and viewed offline, and along with the in-built sensors such as Breadcrumb information, Compass, Altimeter and Barometer to show you your direction of travel, altitude above sea level and the current atmospheric pressure you should never get lost again. Download a wide range of apps from the Google Playstore (Android phones only) including popular outdoor and fitness applications such as Viewranger and Strava. You can also view and reply to text messages using the Built-in microphone, so you can safely leave your phone at home while out exploring.